Only four days and a handful of hours to go before the premiere of The Nine Lives of Chloe King! I was certainly interested before taking part in this exciting, mysterious game with y'all but now I can hardly stand the wait. 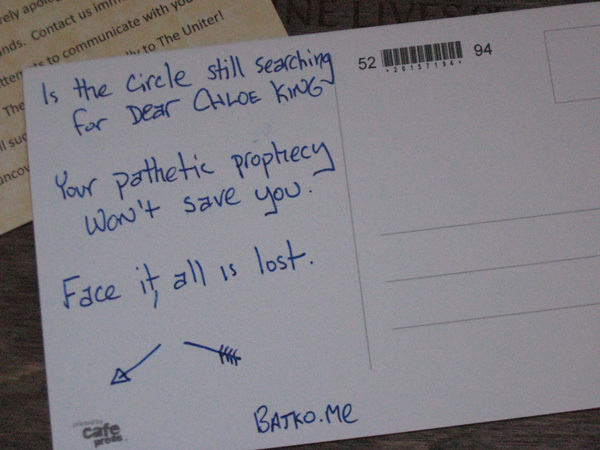 Today we Circles taking part in the Nine Paths to Chloe King game received a new warning and a clue. The Mai sent us a Protection Charm and let us know that their security had been compromised meaning we could potentially receive something from someone we didn't want finding Chloe. 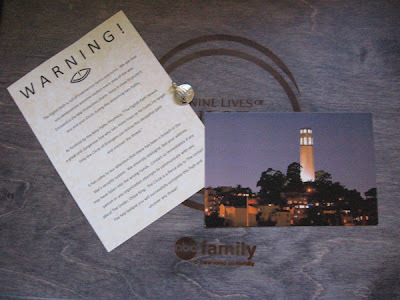 Sure enough a postcard from a mystery source arrived alongside our charm of Protection... 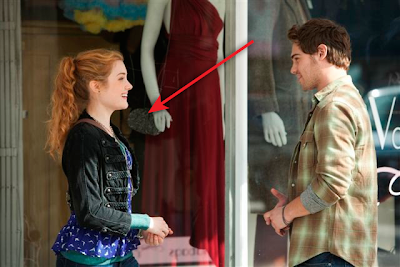 I recognize the towering building from the clip of Chloe being chased but not knowing how it factors into the story I decided to look up towers in San Francisco. As it turns out this is Coit Tower. Scroll down to the Media section of the wikipedia info there for a spoiler of what's to come in the show. Upon closer inspection there's a web address as a signature, batko.me. Batko.me leads us to a photo of Chloe and her crush, apparently this batko guy has been following her around. For those of you playing along on the regular game the wikipedia link has your answer for the virtual game box. Hope you're having fun with that! 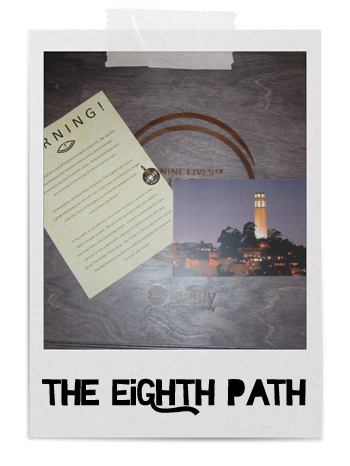 Make sure you come back Monday morning for the Ninth and final Path. I shall be tweeting away (@RhiReading) with the details and good luck trying to be the first person to correctly execute the nine paths for the GRAND PRIZE (details at the game site). Now if you'd like to claim one of those super cool Mai Protection Charms just type the password 'DECEPTION' into the Enter Code box on the game site. For the official details please read on. 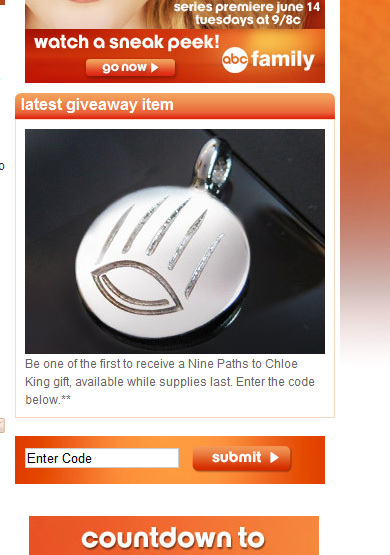 The Nine Paths to Chloe King Free Gift offer (“Offer”) is valid from 5/24/11 at 8:00 AM Pacific Daylight Time ("PDT") to 6/14/11 at 11:59:59 PM PDT or until supplies last, whichever is sooner. 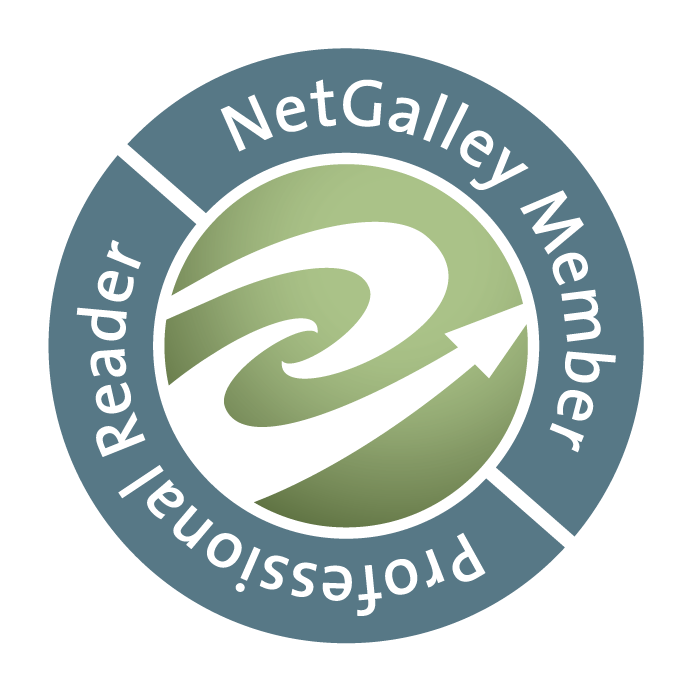 Offer open to residents of 50 US & DC, 13 & older who follow a participating blogger in The Nine Paths to Chloe King Blogger/Journalist Program (“Blogger”) at time of redeeming free gift (“Free Gift”). Each 1 of 3 Free Gifts available is tied to a different code word which will be revealed by Blogger at 3 separate times (estimated to be 5/24/11, 6/6/11, and 6/10/11). 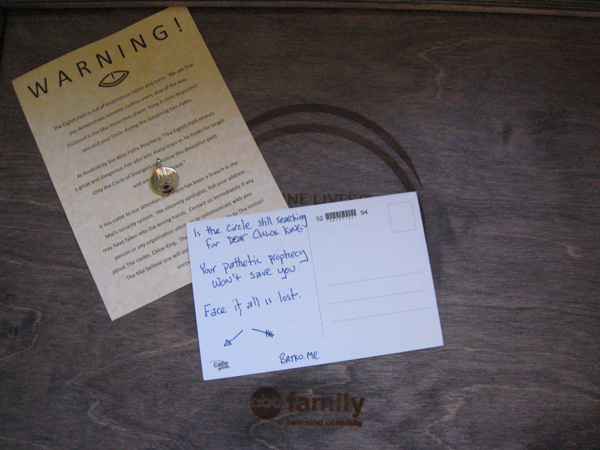 To redeem a Free Gift (while supplies last), go to abcfamily.com/ninepaths & enter code. Expect Free Gift within 8–10 weeks from 6/13/11. Limit: 1 Free Gift/person. Void where prohibited.